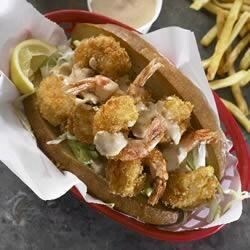 "Crispy fried shrimp sandwiches are served piping hot with a spicy and tangy remoulade sauce." Fantastic! I used frozen fried shrimp to save time. I added green onions and extra cayenne to the remoulade. I'm adding this to my rotation. Fantastic! I did halve the cayenne and next time I will add some salt to the Panko and/or flour mixture on the shrimp.